Ah, the turkey leg. What would Ye Olde Renaissance Faire be without one? And, of course, what would the Ghost of Christmas Present be without one? So felt our director of "A Christmas Carol" this season. The request was for a turkey leg, partially eaten, that could be removed from a dressed plate which is part of a bedazzling display of festive foods. Our version of A Christmas Carol is in it's sixth year, so my involvement in the bedazzling display was limited to gluing on stray berries and shuttling stray glitter back to its intended home. However, the turkey leg was a new addition this year, and so the crafting fell to me. Before I begin, I think it is fair to mention that our Carol is performed in a large proscenium house, and not in our usual, more intimate thrust space. The aesthetic of the props in Carol is more theatrical than the work we usually do, true to life detail is often wasted in this space. First things first, research images as usual. What surprised me the most about the photos of the turkey legs is what a bright pink center most of them have. I expected to see more of the whitish gray that you tend to see in breast meat, but these guys are bright pink. I started with the bone, which was simply a piece of hardwood dowel that ran through the entire "leg." I whittled down the end to give it a bone-like appearance, and sanded away any splinters or sharp bits. In my experience, actors have dainty, soft hands, and they will find ANY imperfection in a prop and injure themselves on it. 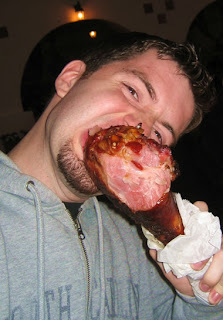 The flesh of the turkey leg is made from upholstery foam. I cut a vaguely- turkey leg shaped chunk of foam on our table top bandsaw, cut that in half, and cut a groove down the center of each half for the bone. Using 3M Fastbond Contact Adhesive (commonly called Green Glue), I joined the foam together with the bone inside, sandwich style. Next, I used my trusty Olfa knife to carve the foam into the shape of a turkey leg. Once the carving was complete, I covered the foam with acrylic caulk. Acrylic caulk is a very good props coating as it can be colored by mixing in acrylic paint, is paintable when cured, and becomes tough and flexible when dry. It can also be smoothed with water before it dries. I happened to have some caulk that was already colored with fuschia paint, so I used that. I would recommend using caulk that is already tinted, as it made it easier to do the final paint job. Once the caulk was dry, I painted. The golden brown look of the skin was achieved with layer after layer of Glossy Wood Tone, the king of Design Master spray paints (trumpet fanfare). I used acrylic paint and gloss medium to try to simulate the tissues in the bite, and did some shadowing on the bone as well. If this turkey leg was for one of our more intimate spaces, I would have done more as far as texture, possibly using hot glue to help with the gristly look where the bone meets the flesh. Once the turkey leg was all dry, it was basically like a nerf turkey leg with a tough coating, so the best part of this project was walking around the shop hitting things with it. Here in Milwaukee, we play with our food! This is a great contact cement for joining foam. Remember, paint it onto both surfaces and allow to dry before adhering. I love these tools. The Utility L-1 is my go to knife for most jobs. I have yet to meet a prop shop that doesn't depend on these paints for many uses. Glossy Wood Tone is basically magic in a can. On the downside, the spray pattern is usually pretty uneven. Like all spray paints, these should be used with proper ventilation and respiratory protection. The show we're about to open calls for a tin of chocolates to be hidden in a drawer. While we have a few little bon-bons in stock, I've been asked to create a few chocolates to supplement the collection. Chocolates are often faked onstage, as real chocolates melt easily under theatrical lighting. Fake chocolates are readily available if you have the budget, but as this is a fairly simple and straightforward project, you can save the money by faking your own. The first thing to do is find a research image. A quick search on the internet can provide us with a plethora of chocolate photos. Since I have a small, square chocolate in mind, we'll go with this lovely morsel. that you are working in a space stocked with the basics, so I haven't included basic tools and supplies on the materials list. Let's begin! 1. I used 1/2" thick insulation foam as a base for these chocolates. It is cheap, readily available, reasonably durable, and lightweight. I started by cutting the foam into 1" squares with a utility knife. Then, I sanded the top edges and corners with 100 grit sandpaper to round them over, as the top of most dipped chocolates is not perfectly square. I always find it helpful to make a few extras of whatever I'm creating, if possible. That way, I can make some mistakes along the way. with brown acrylic caulk. I like to wear gloves to keep my hands from getting messy, and use a tongue depressor to spread on the chocolate. Once the top and sides are covered with a good layer of caulk, I dipped my finger in water and used it to smooth the caulk out. Then, I placed the chocolate on a piece of tin foil to dry. 3. After allowing the caulk on the chocolates to partially dry, I piped on the decoration. When doing small projects like this I've found that snipping the tip off of a plastic baggie makes a great disposable pastry bag. The piping took a bit of practice to get the feel right, so those extras that I cut came in handy. I did most of the piping in brown caulk, but I also tried the white, for a different look. 4. After the tops and sides were dry ( a few hours), I flipped the chocolates over, and coated their bottoms with caulk. Once the chocolates were completely dry, their color looked good, but the caulk was a little dull. I used a light spray of Krylon Crystal Clear, Satin Finish to give them just a bit of a sheen. 5. Presentation. My Dad once told me that food is 90% presentation. This may not be true in real life, but it certainly is in food fakery. 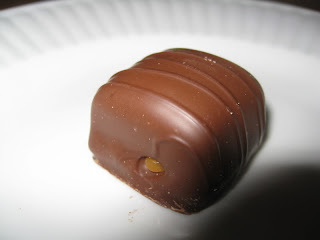 These chocolates were each placed in a candy cup (available at candy making shops or big box craft stores), and placed in a tin with our other chocolates. The tin, painted by Margaret, is partially empty to allow a deck of cards to be hidden inside. Need more info about chocolate? Here are a few links to some good propsy info. Enjoy! Here is a link to Hershey's company history, with a few good pieces of graphics reference for you ephemera hounds. Cadbury Chocolates made in Bourneville, UK are a favorite around the world. You can read about their products at this site. If you have time, read about the history of their company. The early Cadbury company was revolutionary in caring for its employees. To this day, the whole town of Bourneville smells of the chocolate factory there. Yum! Welcome to the wonderful world of culinary fakery! My friend Eric Hart has a lovely props blog where he expounds on all things props. Since I saw his blog, I've been wondering about how I, too, can contribute to the general knowledge of prop artistry flying about the internets. So, I've decided to do a blog of my own, specifically related to fake food craftsmanship and casting and molding - the two things I specialize in here at the good ole MKE Rep. I am by no means the leading authority these topics, but I have a few years of propping under my belt now, and ever-mounting experience in the dimly lit props kitchen. I think it's time to share some of my successes (and some of my hilarious failures) with you lovely people. The first step was choosing a name, and I have to say that my friends were full of helpful suggestions. As promised, Sarah Heck (a propster extraordinaire herself) will be rewarded with a plate of (actual, edible) chocolate chip walnut cookies for her suggestion of Fake 'n Bake. 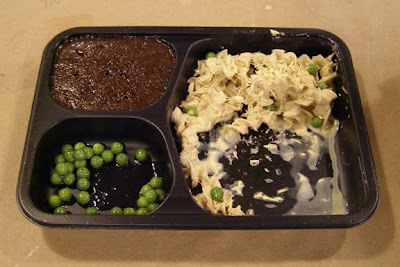 Special mention should also go out to Linn Elliott for her hilarious, if cumbersome, Pate de Faux Gras. Other contenders included Sham Cast Bakery, Inedibles, Easy Fake Oven, Fresh Faked Goods, and Kitchen of Lies. Thanks to all. I hope you'll find this blog to be helpful and amusing. Please send comments and questions, I'll do my best to answer you or to point you in the direction of an answer. So, let the fakery begin.